After three minor snow events in four days, it was nice to get a break here in the Northeast and the weather relaxed enough for me to take a jolt up to Boston for a sports doubleheader. The four-hour drive went super fast thanks to another entertaining pod from “Something to Wrestle With” as I thoroughly enjoyed the Jake The Snake episode. There were about six things that I tried to remember to search YouTube for later that night in the hotel. Before I knew it, I reached Chestnut Hill after about 10 minutes of navigating the twisty roads that randomly branch off in the area. This was my second visit to this beautiful campus and since I did all the touring during the football trip a few months ago, I went right to the arena for the game. 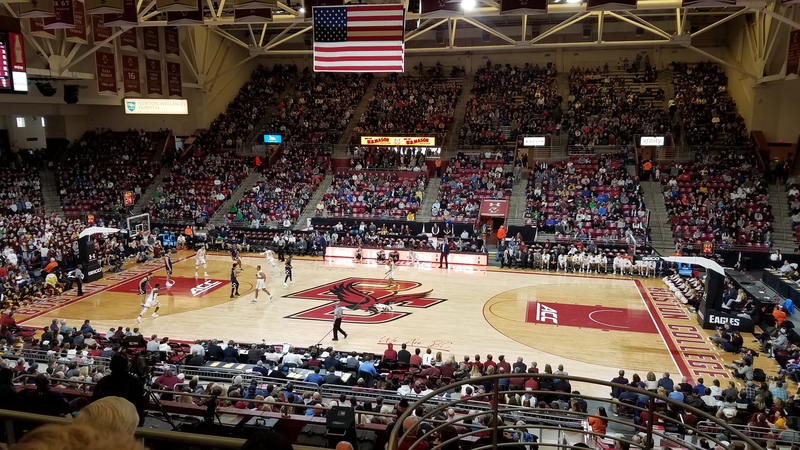 Conte Forum has been home to both Boston College basketball and hockey since 1988. The multi-purpose venue displays school character quite well with maroon and gold all around and a mighty impressive trophy case highlighted by a bronze eagle. 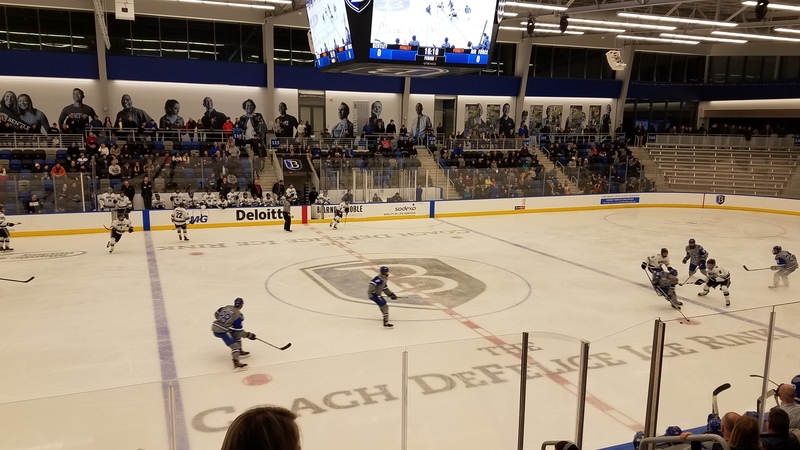 For basketball, the seating bowl isn’t as great as others in the conference since corners have poorer sightlines given that the building needs to support hockey. Also, the top-half of the seating is uncomfortable bucket bleachers. At least the views are good with an adequate pitch between each row. BC came in to this contest against Notre Dame at 1-4 in the conference, yet they put up a good fight and this was an entertaining affair. The Irish pulled through in the end 79-73 and watching them in person, I remember that I’ve always enjoyed the style and way that Mike Brey’s teams play. My BC takeaway is that Kyle Bowman is a selfish player constantly looking for his shot and I’m guessing he takes half-a-dozen bad ones per game. There was a good crowd that turned up for this one and we were treated to a student rendition of Mr Brightside, an enjoyable BC tradition. Getting out of the Commonwealth Garage on campus was a nightmare and it took me 30 minutes just to get out of BC. I’m glad that I didn’t go with the original plan and see UNH hockey in the evening as time-wise, it would’ve been way too close for comfort. Instead, I traveled over to nearby Waltham, for an off-List game at Bentley University. Before that, I walked down Moody Street in this city nicknamed for their Watch production history. Originally, I planned to eat in the Deli at Moody’s, but the place turns into a reservation-only dinner at night, so I settled on Bison County, which was a good alternative. The school just opened Bentley Arena last year as decades of playing at a municipal rink a town over finally ended. It is a terrific facility that has wonderful, energy-saving technological advances. The color-scheme is quite sharp and everything about the building is sleek. They only built it for 2,000 seats, so the bowl features just 6-7 rows around the rink. It is steep, but with so few rows, only the top couple have an obstructed view without glass partitions / seating angle inevitably getting in the way. Attendance is certainly better at the new place, however the student turnout was disappointing as the “Top Shelf” section sat mostly empty with less than 100 on hand, half of them just playing on their phones. The atmosphere was odd because when the crowd popped for a goal, the celebration from the fans lasted 10 seconds. As for the game, it was dull and clutzy with players seemingly falling over themselves. Bentley won their ninth in a row over Air Force 4-0. Fun Fact: This was the first matchup where each team had the same nickname (Falcons).